Khalid Sheikh Mohammed (خالد شيخ محمد‎) is reported to have been born in Kuwait to parents from Baluchistan in Pakistan. He spent some of his years in Kuwait. He joined the Muslim Brotherhood at age sixteen. He returned to Pakistan soon after, and after spending some time there. He went to the United States for further study at North Carolina Agricultural and Technical University in the US where he graduated with a degree in mechanical engineering in 1986. He attended Chowan College for a semester (beginning in 1983) before transferring to the North Carolina Agricultural and Technical State University. The following year he went to Afghanistan, where he and his brothers alongside Osama bin Laden fought against the Soviet Union during the Soviet invasion of Afghanistan. There, he was introduced to Abdul Rasul Sayyaf, of the Islamic Union Party. Mohammed moved to Qatar to work in a government office as a project engineer for the Qatari Ministry of Electricity and Water. He stayed at this job until 1996. In early 1996 he fled to Pakistan to avoid capture by U.S. authorities. His first involvement with terrorism was a financier of the 1993 truck bomb attack on the World Trade Centre. This attack was planned by a group of conspirators including Ramzi Yousef, Mahmud Abouhalima, Mohammad Salameh, Nidal Ayyad and Ahmad Ajaj, for which his nephew, Ramzi Yousef, was later found guilty. After the World Trade Center 1993 bombings, Mohammed decided to engage more directly in anti-U.S. activities. He traveled to the Philippines in 1994 to work with Yousef on Operation Bojinka, a Manila-based plot to destroy twelve commercial airliners flying routes between the United States, East Asia, and Southeast Asia. The plot was foiled after their flat caught fire and Yousuf was tracked to Pakistan. Mohammed traveled in 1995 to Sudan, Yemen, Malaysia, and Brazil to visit elements of the worldwide jihadist community and meet with Osama bin Laden later that year. Mohammed began work on the September 11 attacks in 1998. In 2003 he was working on a plot to hijack aircraft and crash them into Heathrow airport, Big Ben and Canary Wharf when he was captured in March at a house in Rawalpindi, Pakistan. According to the 9/11 Commission Report he was “the principal architect of the 9/11 attacks.” The first hijack plan that Mohammed presented to the leadership of al-Qaeda called for several airplanes on both east and west coasts to be hijacked and flown into targets. His plan evolved from an earlier foiled plot known as Operation Bojinka, which called for 10 or more airliners to be bombed in mid-air or hijacked for use as missiles. 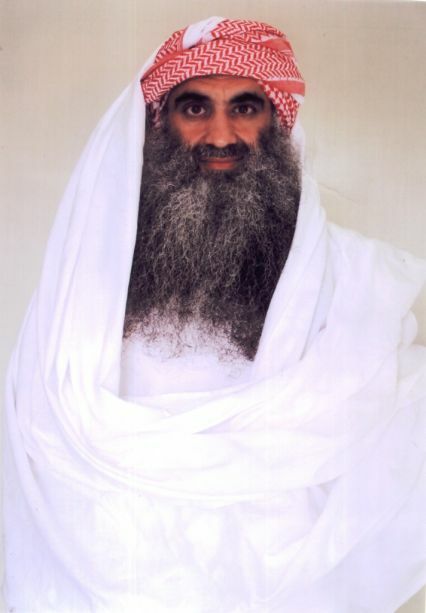 In late 1998 or early 1999, bin Laden gave approval for Mohammed to go forward with organizing the plot. Bin Laden provided leadership for the plot, along with financial support. Bin Laden was also involved in selecting people to participate in the plot, including choosing Mohamed Atta as the lead hijacker. a document that listed the pilot license fees for Mohammad Atta and biographies for some of the 11 September 2001 hijackers. images of passports and an image of Mohammad Atta. transcripts of chat sessions belonging to at least one of the 11 September 2001 hijackers. a list of killed and wounded al Qaeda militants. Planned assassination attempts on Pope John Paul II, Pervez Musharraf and Bill Clinton. Plans to destroy U.S. embassies in Indonesia, Australia and Japan in 2002. The planned assassination attempt against then-U.S. President Bill Clinton during a mid-1990s trip to the Philippines. This guy has some issues. They need to have his trial in another country.